One of the largest selling television brands in the world, TCL and America’s popular streaming service, Roku have come together to create an innovation in terms of design and technology. The result is this amazing TV.This Smart TV’s simplicity is truly incredible. The TV is designed according to the modern, latest technology, but is also highly simple and easy to operate, and it provides endless entertainment opportunities for the viewers. This means you are able to choose from over 2,000 streaming channels which feature 200,000 TV episodes and movies, as well as news, music, live sports, food, kids and family, foreign language, fitness, science and tech, and much more. Roku TV delivers the most comprehensive and simplest Smart TV experience on the market. An amazing user interface puts its streaming video and thousands of applications on the same plane as standard TV. Also, it is more affordable than pretty much any other Smart TV. It is true that its picture quality could be a bit better, but for an entry-level set like this one, TCL 32S3850 is an awesome Smart TV. Besides the fact that this TV’s performance and technology are truly great, it scores high on its appearance as well. The external styling of the S3850 series is, according to TCL and Roku, the only thing that differentiates it from the S3800 series. The TCL 32S3850 boasts and all-aluminum quad stand, and a metallic gun-metal finish. It can be used to grace any part or the room of the house as it exudes elegance and class with its all round metallic finish. The nice stand supports the base of this TV, and adds contrast to the TV’s pitch black home screen as well as sophistication to the overall design. This Smart TV is built for providing a comprehensive experience to viewers, in terms of both operation, and entertainment. 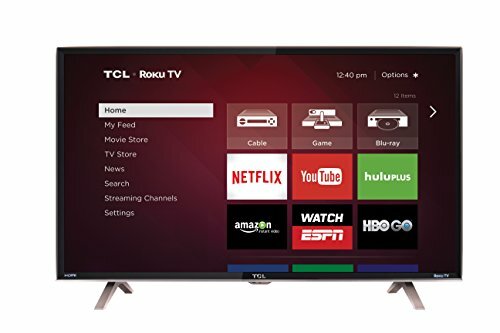 You can personalize your TCL 32S3850 Roku Smart TV Home screen and put all your favorite streaming channels, gaming console, broadcast TV, and any other devices front-and-center. Therefore, you no longer need to wack your brains to find your favorite show among the vast variety of others. Also, this TV provides you with an easy and simple way of finding the content of your choice, without the need to wander across cluttered menus. Just like with applications on a smartphone, you will have all your favorite content at your fingerprints from the moment you turn this TV on. This Roku Smart TV is truly an amazing source of fun and entertainment, since it is a place with over 2,000 streaming channels which showcase an equally comprehensive number of TV episodes, movies, music videos, news, family talk shows, live sports, and so much more. Viewers are able to tune into any show they like, since there are numerous shows referring to a truly large range of different topics like sports, technology, science, politics, religion, tourism, fitness, and foreign languages. People can easily get addicted to the amazing viewing experience and lots of entertainment opportunities this TV offers. There are also hundreds of free channels, and if you already subscribe, there are no additional fees for shows and movies from top streaming channels such as Hulu Plus or Netflix. If you are already a cable subscriber, you can find new ways to enjoy. By simply talking or typing, you are able to search through the biggest, widest selection of channels. The TV provides you with the possibility to follow your favorite channels in order to always be informed when it is ready to stream, and at what price or on which channel. The extremely simple, included remote control is perfect for searching, controlling, and adding new channels. Or, you are even able to search with your voice, and in this way transform your tablet or smartphone into a Roku remote by downloading their free mobile application. Numerous smart options include sending music, photos, and videos from your tablet or smartphone to the TV. Also, you can cast web videos, movies, and other stuff with YouTube and Netflix mobile applications.